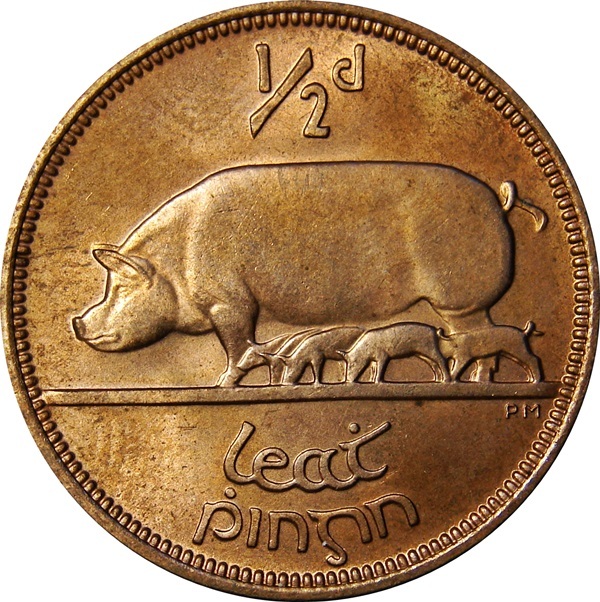 The halfpenny (½d) (Irish: leath phingin) was the second-lowest value coin of the pre-decimal Irish pound. There were 2 to a penny, 24 to a shilling, 48 to a florin and 480 to a pound. First issued in 1928 it ceased to be legal tender on 1 August 1969, although they were readily accepted by shopkeepers until decimal day in February 1971. Since the Irish pound was pegged to the British pound until 1979, the Irish halfpenny (decimal and pre-decimal) had the same dimensions and weight as the British versions. Irish and British pre-decimal halfpennies officially measured 1.005 inches (25.5 mm) in diameter and weighed 5.66990 grams. These bronze coins comprised 95.5% copper, 3% tin and 1.5% zinc. 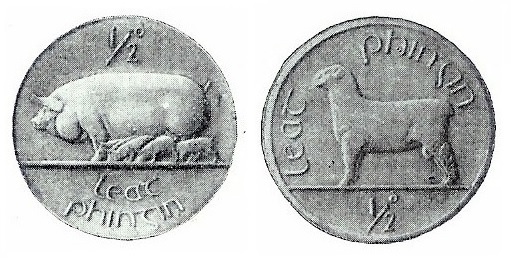 Similar to the other seven Irish Free State coins, the Irish halfpenny was designed by the English artist Percy Metcalf. The artist was given the choice of a boar, a sow or a ram. Metcalf produced patterns for both sow and ram – the sow was chosen by the committee (chaired by W.B. Yeats). There was much controversy over this decision at the time because many critics felt the depiction of a pig was too close the derogatory cartoons of ‘Paddy and his pig’ – which featured in Punch magazine from Victorian times onward. Pork and bacon were major Irish exports at the time, so the committee ‘went with the money’ (pun un-intended). 1928-67 Irish Halfpenny (reverse design). The actual reverse design used on the first coins of 1928 featured quite a few modifications to the original pattern submitted by Metcalf. This was done to improve metal flow and other mechanical coin production reasons. 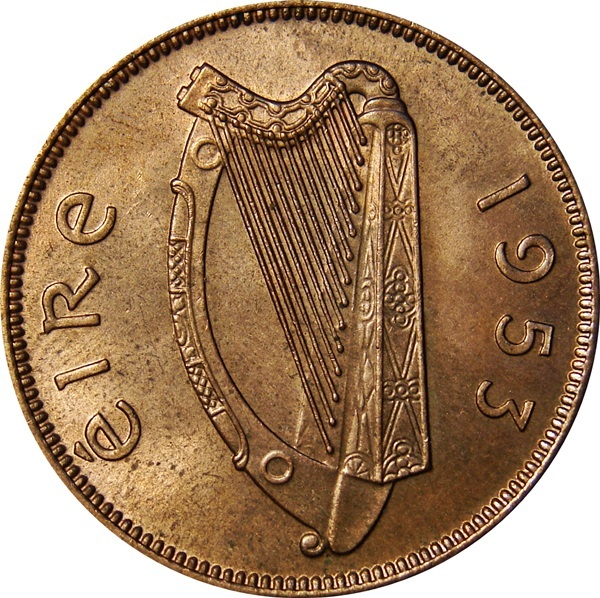 The obverse featured the Irish harp. 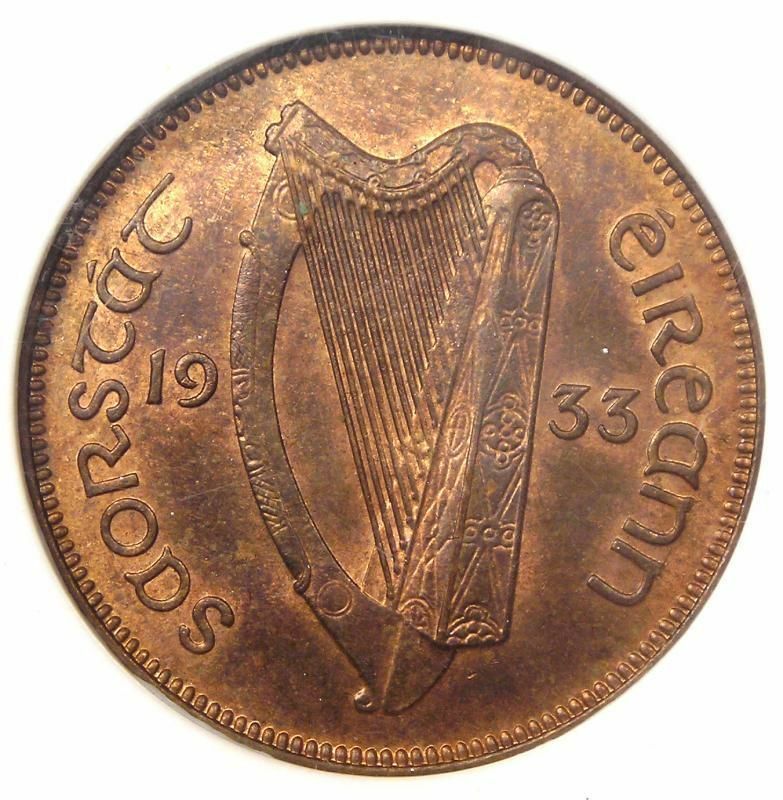 From 1928 through 1937 the date was split either side of the harp with the name Saorstát Éireann circling around. From 1939 through 1967 the inscription changed to Éire on the left of the harp and the date on the right.